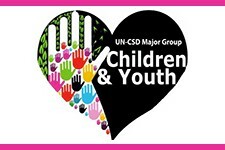 The Major Group for Children and Youth (MGCY) is the official voice young people under 30 years on sustainable development at the United Nations. It engages with young people from across the world and through networking and collaborating puts together strong teams that contribute to the policy negotiations. The MGCY also works to inspire and platform youth activism through a series of working groups, aimed at bringing people together to help build the global youth voice.